The Austrian Black and Tan Hound is one of the three Austrian Grand Brackes, or 'large hounds'. The other two are the Tyrolean Hound and the Styrian Coarse-Haired Hound. In its homeland, this breed is known as the Brandlbracke, which is derived from the German word brand, which translates into 'fire'. This refers to the little patches of red hair in its coat. On a hunt they can be used on a wide variety of game, the most common being hare and fox. Traditionally they hunted in small to medium-sized packs, throughout the Austrian Alps, with the hunter on foot. The exact origin of the Austrian Black and Tan Hound is a mystery. We do know that it is closely intertwined with the other Grand Brackes, the Tyrolean Hound and the Styrian Coarse-Haired Hound. The root stock of these three breeds have been interbred for centuries, and the Austrian Black and Tan Hound did not have a standard to cease this breeding until 1884. Most often it is stated that the Grand Brackes descend from the ancient Celtic Hounds. However, this is more legend than fact. If there is any Celtic blood, it would have been heavily diluted. Most scenthounds throughout Europe have been crossed with each other for centuries. 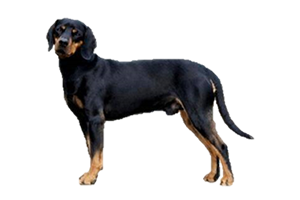 It would be impossible to pinpoint which breeds (or more accurately, types) of dog were used in the Austrian Black and Tan Hound’s creation. The Swiss Laufhunds and Bloodhound are perhaps some of the most likely. Today the Austrian Black and Tan Hound remains rare outside its homeland. There it is still kept primarily for hunting and not often as solely a household pet. Is the Austrian Black and Tan Hound Right for You?